Rustic, homespun, but nevertheless distinctive is this Amish Country Popcorn Burlap Bag Merchandising concept. The package substrate is burlap which is seldom seen outside rural and wholesale uses. But here it is used to good effect as the textured backdrop to a boy and girl Amish Country logo. Do the Amish eat popcorn? Why not if prepared low-tech. And I’m sure its a country mile closer to farm grown than most brands. 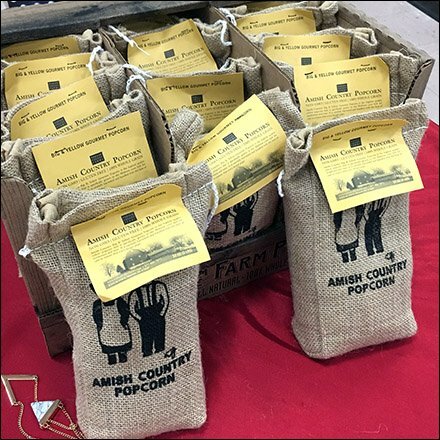 Also of interest is that the retailer venue for this Amish Country Popcorn Burlap Bag Merchandising is the BonTon Department Store not some local Farm Store.